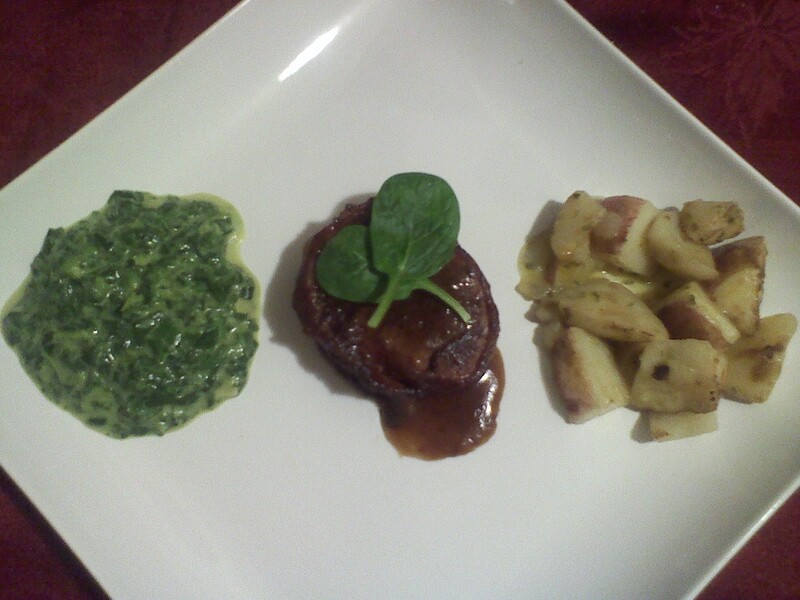 Yesterday for dinner I decided to make some filet mignon wrapped with bacon, a side of cream of spinach and roasted red skin potatoes. What a mouth watering dish this was. It was the perfect amount and room for dessert. Filet mignon is considered the king of steaks because of its tender, melt in the mouth texture. A prime filet mignon can literally be cut with a fork. This beef cut can be quite expensive when dining out, but much more reasonable to make at home, especially if you purchase a whole tenderloin. ENJOY!! Thx =)…rib eye is great but it needs to be done just right or else it doesnt turn out. How do you do your rib eye? This is one of my preferred cuts of meat, I love that there is so little fat, cuts like butter and still is so flavorful. This is a meal I’d love! This looks amazing. I am nervous to cook filet mignon–any tips? Dont be nervous its not a big thing…Filet Mignon is I think one of the easiest meats to cook. Its such a tender cut. First Season the filet mignon with pepper, salt and other seasonings (wrap with bacon if desired). Pour 3 teaspoons of butter or margarine in a skillet. As soon as it’s heated, put 3 teaspoons of olive oil and mix them on high heat (Tip: if you dont want to use butter just use olive oil). Next step is to put the filet mignon in the heated pan. Once one side becomes golden brown (which is about 8 to 10 min depending on your stovetop and how you like your steak done), turn it over to cook the other side. Add another spoon of margarine or butter and cook for another minute. ENJOY!! Rule of thumb: wrap everything in bacon. Even though I’m a vegetarian, this looks really delicious!